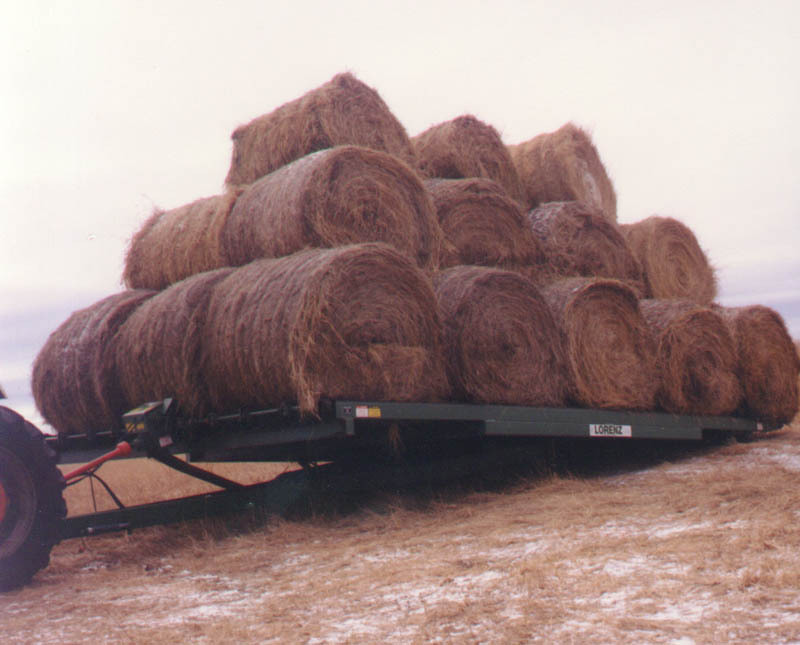 Available in an assortment of ideal sizes, the Lorenz 10-ton and 18-ton Haystack Movers give you the needed leverage to efficiently move larger stacks from field to storage to feeding area. 540/1000 RPM PTO or hydraulic driven bed chains make for quick loading and unloading of large bale stacks. The rail roller chain, with SK-1 clips, is available in the standard Heavy C2062H or Big C2082H sizes. 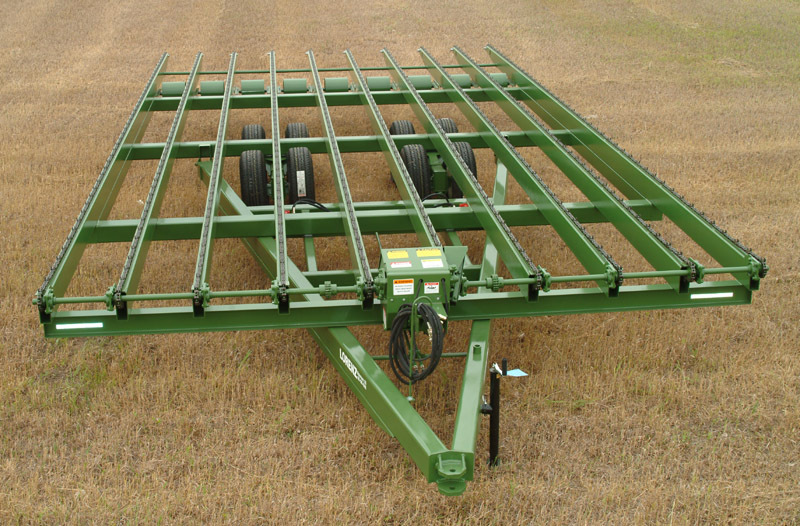 Our drive box sprocket combinations will easily match the speed of the haystack mover bed chain to the speed of the tractor, or a speed of your comfort. Available with two-way rigid tandems, two-way heavy duty rigid tandems, or four-way heavy duty oscillating tandems. 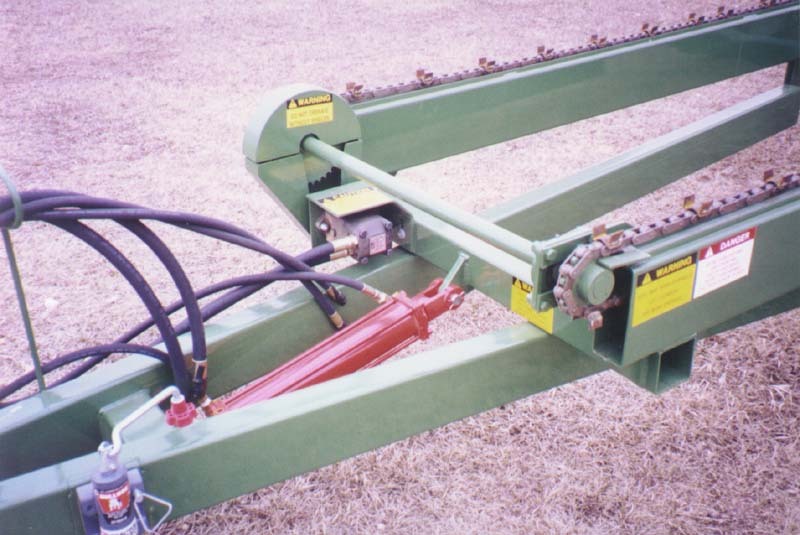 Hydraulic supply hoses with pioneer tips are standard with all Lorenz hay movers. 8 rails 6"x 3" with heavy C2062H or 8"x 3" with big C2082H roller chain, with SK-1 clips, on 13' wide movers. 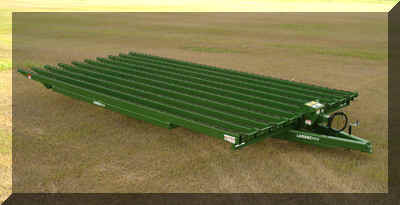 10 rails 6"x 3" with heavy C2062H or 8"x 3" with big C2082H roller chain, with SK-1 clips, on 15', 16', & 17' wide movers. 2" axles with heavy duty 6-bolt hubs. 3 1/2"x 10" two-way hydraulic lift cylinders. Gauge wheel drum rollers between alternating rails. 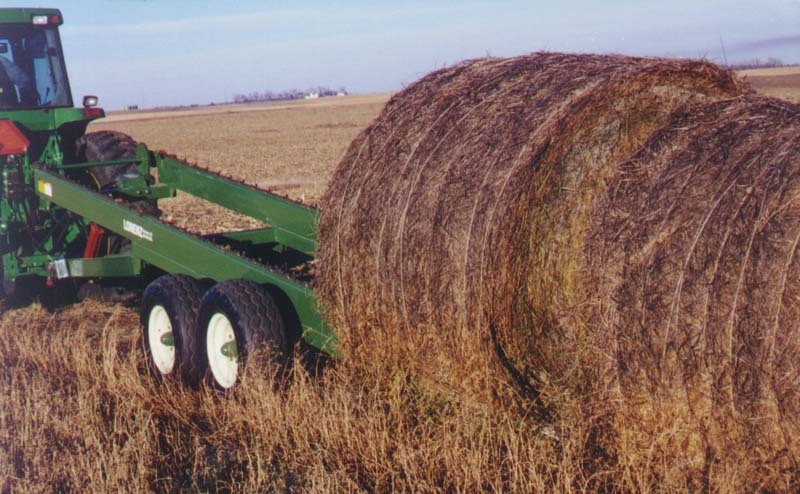 With the Lorenz 5-bale hay sled, you can easily retrieve, transport, and place up to five round bales at one time. 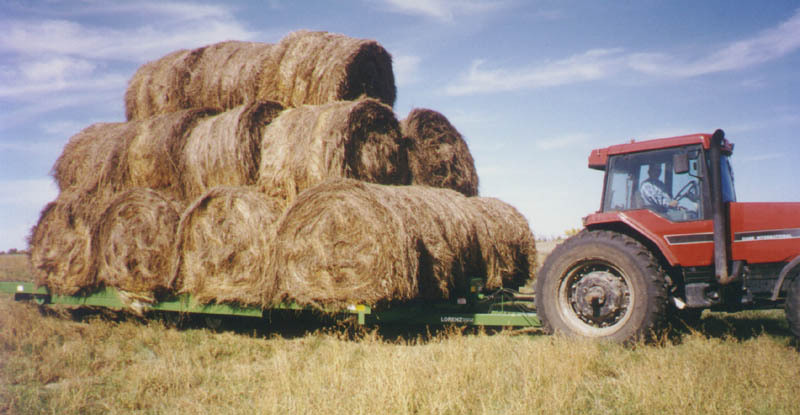 Hydraulically load/unload single bales, or in a row stack, without leaving the tractor. 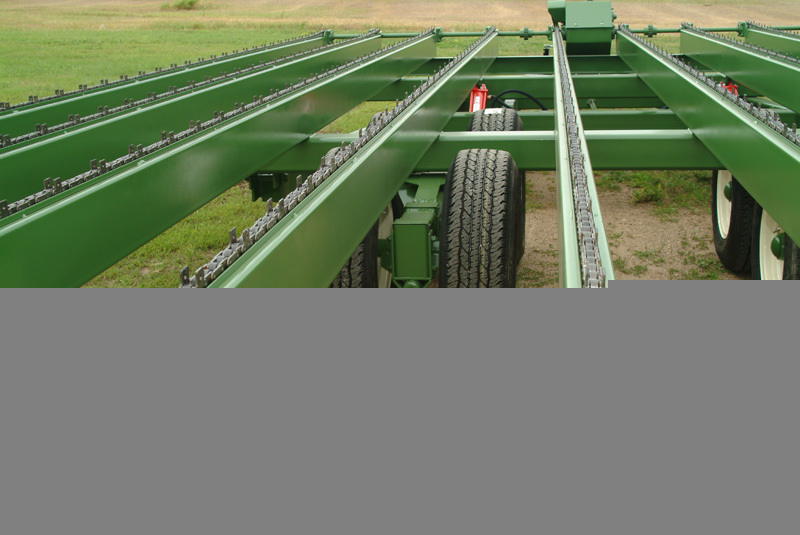 The walking-beam axle equally distributes the load over uneven ground. The hydraulic bed tilt angles the rear to the ground. Heavy C2062H roller chain, driven by a 11.9 cu. in. hydraulic orbital motor, moves the hay along two 27 foot 6"x 3" steel rails. 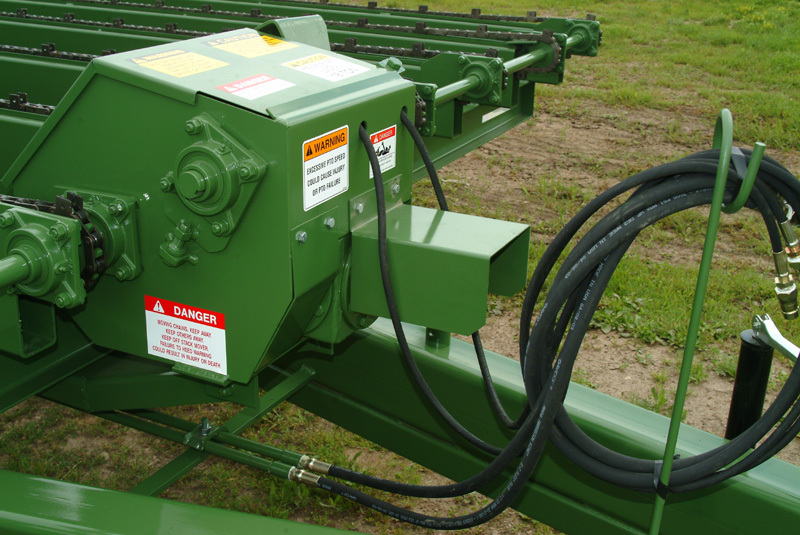 hydraulic supply hoses with pioneer tips are standard with all Lorenz hay movers. Bed length - 27 feet. Bed height - 32 inches. Four heavy duty 6-bolt 6,000 lbs. hubs. Four LT 245 75R 16 10-ply radial tires. 11.9 cu. in. hydraulic orbital motor. *15 Ton Requires Optional Upgrade to HD Rigid Walking Tandem or HD 4-Way Oscillating Walking Tandem. Copyright 2018 - Lorenz Mfg.